With over 3000+ installations worldwide and for over 20 years, MIOX offers the only self-cleaning hypochorite with peroxide advanced oxidation generators. MIOX chemistries show faster or greater log kill at equal doses on all classes of microorganisms including bacteria, viruses and protozoan oocysts. MIOX systems simply combine table salt, water and power to produce safe and cost-effective drinking water, reuse or wastewater disinfection. 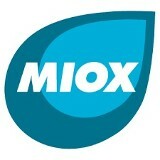 MIOX Mixed Oxidant Solution (MOS) systems also convert some of the oxygen in the water molecule into hydrogen peroxide. This combination of sodium hypochlorite and hydrogen peroxide creates a unique chemistry that has many proven operational benefits in drinking water, reuse and wastewater applications.